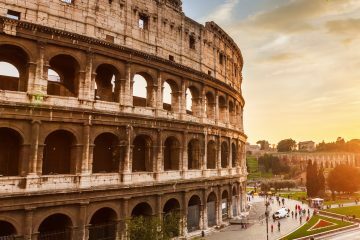 When we were presented with the endless food experience options while preparing our travels to Bologna, our minds were overloaded with thoughts, nay dreams, of pasta, meats, and cheeses. 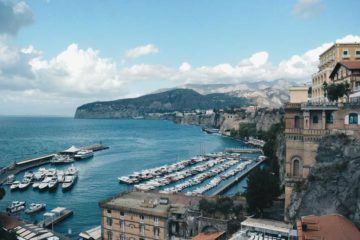 Before we made plans for anything else, we knew that we wanted to eat as much as possible during our time in Italy and we wanted to eat the best of the best. 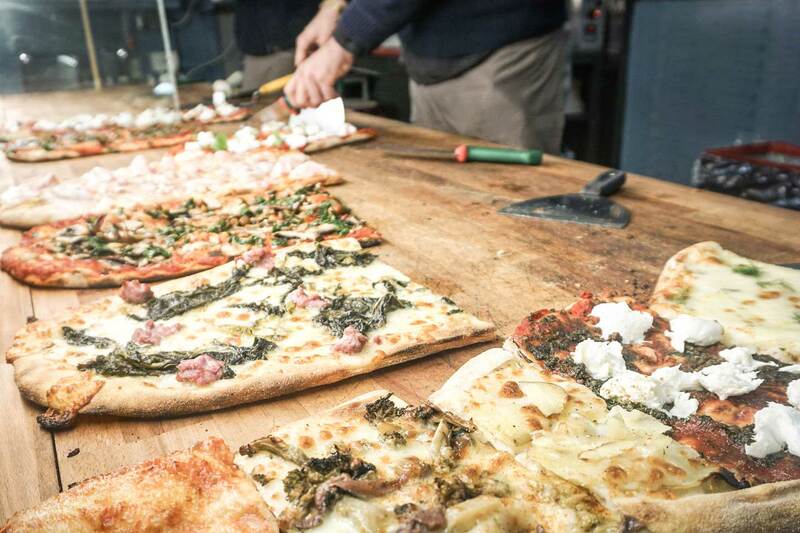 As we are firm believers that the best insight into any culture is through their food, we took a look at what kind of food tours were on offer. Finding what looked like a local foodie tour offering to help us devour the city of Bologna, we set off to uncover the culinary capital of Italy one bite at a time. 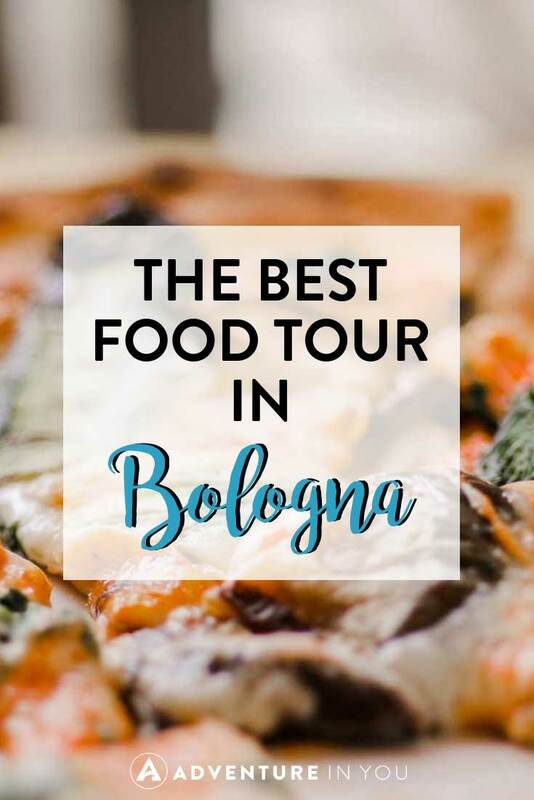 As we had already booked a Bologna cooking class through Cookly and it was super easy, we decided to look here first for our food tasting tour options. As always, we found a bunch of different options that offered short tours, long tours or some that included a cooking class, so we looked at which one would suit our needs and schedule. What’s great about Cookly is that all of the options are laid out on one screen for you and you can filter the results depending on your preference. After much consideration and deliberation, and I’m not going to lie, salivation, we decided to taste the city with the well-rated Bologna food tasting tour with a local. Not only did we read heaps of positive reviews about this tour but we also liked that it started at 10 AM and was a good 4.5 hours long. 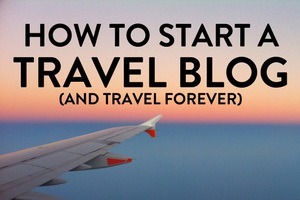 This fitted perfectly with our plans as we wanted an insight into the city and its food before deciding what we wanted to explore further ourselves. 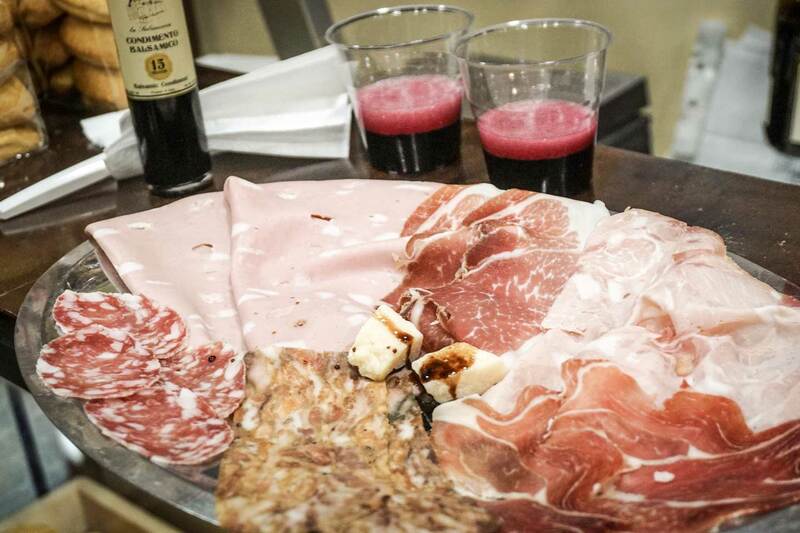 If you want to see the other Bologna food tasting tours on offer, check out the link below. The morning of our food tour, we had already been in Bologna for one full day where we had explored a little and took a 5-hour market tour and cooking class in the evening. To say we were pumped about more food and exploration was an understatement. 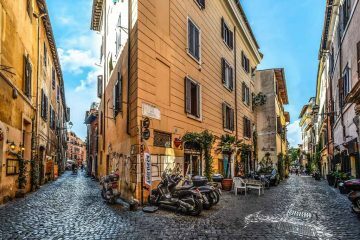 Walking through a maze of winding side streets, we headed towards Piazza di Porta Ravegnana where we would be meeting our local guide in front of the Feltrinelli Book Store. The meeting place was really easy to find as this main square is home to the Two Towers of Bologna. Immediately when we arrived, Mattia was already waiting there (even though we were early) and he greeted us with a warm and friendly welcome. It appeared to be only us on the tour which I loved and he gave us a quick run through of what we would be doing (and eating!). Before we set off, Mattia handed me a map where he had highlighted the route we would be taking as well as each stop on our tour. I loved this personal touch and being able to follow where we were going really made us feel like we were all exploring together rather than just being led around by a guide. This, for me, set an intimate vibe right from the start and it carried on throughout the whole tour. Our first stop was at an extremely local cafè for breakfast. Walking into this small and busy place, Mattia walked us to the back of the shop where we had our own little special table waiting. As we were so excited to try what the locals have here, he ordered us an Italian breakfast: cappuccino e cornetto. Although I’m not a coffee drinker, the coffee was so smooth and rich with flavor and it went perfectly with the croissant, a delicious sweet treat that was in complete contrast to the bitterness of the coffee. While we ate and drink enjoying the general bustle of the cafè, we got to know Mattia and he gave us an interesting introduction into Italian coffee and the coffee drinking habits of the Bolognese. 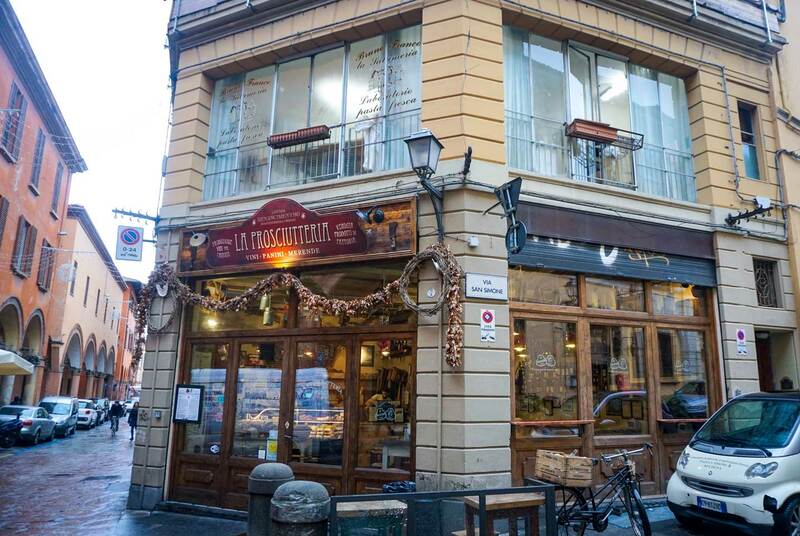 When we left the quaint little Caffè Terzi and we walked towards the pasta lab, I assumed that we would be going to a big factory with big heavy machinery and workers loading and unloading but boy was I wrong. As we rounded a corner, Mattia pointed to the upper half of a building which was atop a restaurant and he said that that’s where we were headed. After being buzzed in, we ascended a narrow staircase and entered a single room which was rife with perfectly synchronized activity. I think I stood here watching these workers with my mouth hanging open for the whole time I was here but my reaction was completely justified, the efficiency and skill which was occurring all around me was nothing short of incredible. 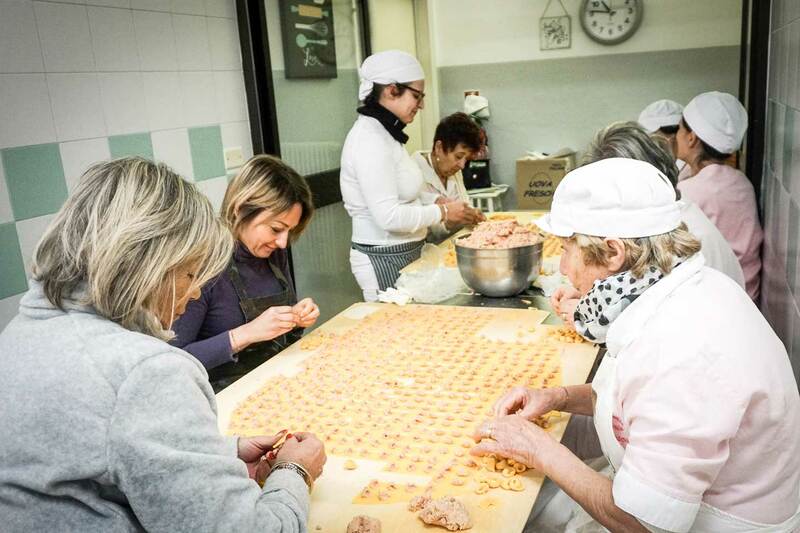 Full of 12 workers (11 of them female and a single male), we watched them handmake tortellini for about 15 minutes. 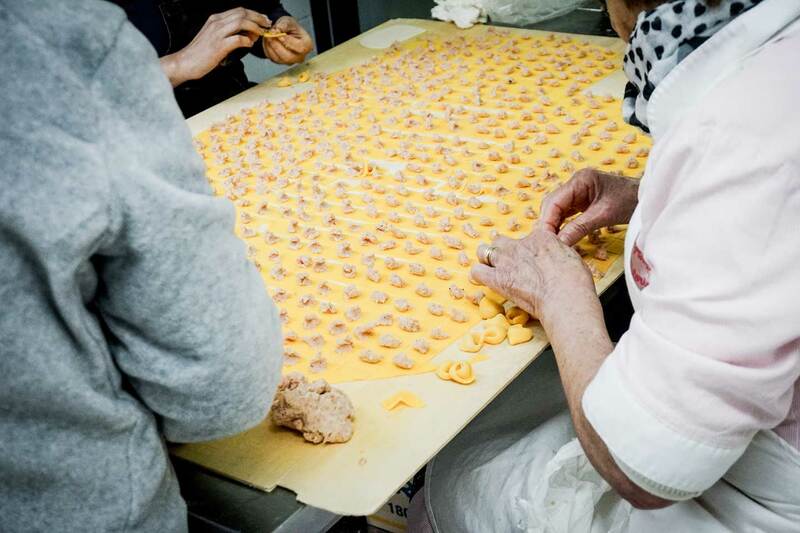 Within that time, hundreds of tortellini were made, and were lucky enough to see firsthand how streamlined the process was. First, the male worker made a massive batch of meat while two other workers made the dough, rolled it and cut it into squares, these were then transferred to a table full of around eight workers who placed equal amounts of meat filling onto every square and then they began to expertly fold each square into a perfectly formed tortellini. It wasn’t long before hundreds of identical tortellini were folded and these were transferred to be dried and cooked by another worker. We saw this process about 3 times in the short time we were there and we even saw the workers rotate positions. 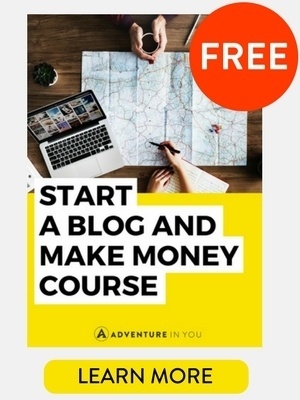 It seemed like everyone knew what they were doing and where they were going next without any communication; it was truly a well-oiled machine! 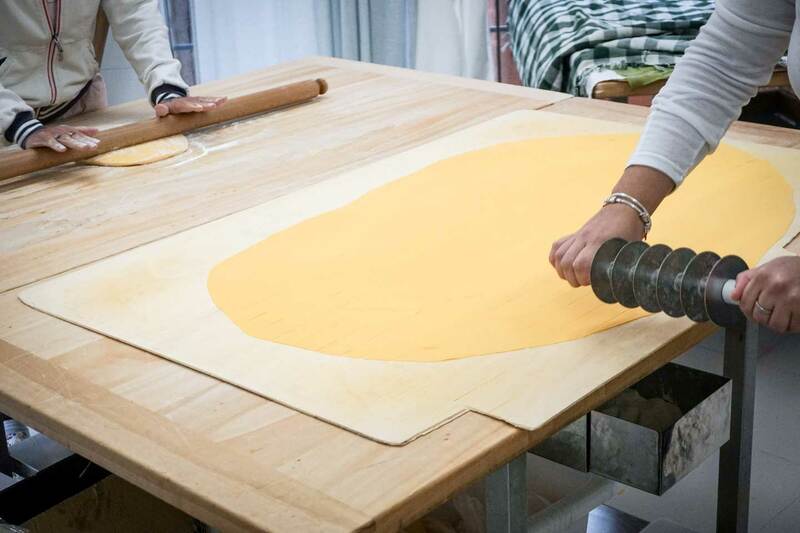 Watching this group of people make traditional Italian pasta using ancient cooking methods was an amazing experience, one that I think was the highlight of my whole trip in Bologna. In our cooking class the day before, we had folded tortelloni in the same way so we knew how hard the technique was and these were so much smaller! Not only were they able to do it so much quicker than we did but each one was perfect and exactly the same as the previous. Absolutely amazing. I didn’t want to leave but we were headed to our next stop, so everyone gave us a friendly goodbye. After experiencing the pasta lab, we took a brief walk around the city where Mattia showed us some big sites and main squares as well as hidden places that we should explore further. It was a great overview of the city and its history and he had plenty of funny tales to share. Heading back towards the pasta lab, our next stop was a shop opposite where the pasta would be sold. How cool is that? Not only did we get to see where and how the pasta is made but we also got to see where it would be sold, it was a whole family business. At Salumeria Bruno e Franco, we got to meet the owner, Franco himself. He very kindly made us up a plate of cured meat, Parmigiano and balsamic vinegar for our tasting paired with a rich sparkling red wine local to the region. As much as we tried to savor every bite, we ended up devouring the plate and silently making a note of the meats we tried and the age of the cheese and vinegar to buy later! We enjoyed the atmosphere in this local store; far away from the most touristic areas of Bologna, Bolognese locals were coming in and out every couple of minutes to buy salami, mortadella, pasta or cheese, and Franco served everyone with a friendly and passionate manner. With our taste buds more than satisfied, we said grazie and arrivederci to the lovely people who accommodated us and took a brief walk to the next stop: pizza! Now, we may have just eaten but we were not yet full, so the prospect of Roman pizza made us drool. This pizza joint was quite busy as it was lunchtime, but the guys behind the counter served every hungry mouth with ease dishing out slices of pizza with a crunchy base fresh from the oven. The pizza that we sampled was a simple tomato and mozzarella but boy was it fresh and delicious. The art of Italian food is that such fresh simple ingredients come together to create a dish that is bursting with flavor, and it was no different at PizzArtist. With the cured meats and a slice of pizza whetting our appetites, we were now ready for the main course. Walking a short distance to the highly popular Trattoria Tony, we were welcomed with open arms and shown to our reserved table for lunch. 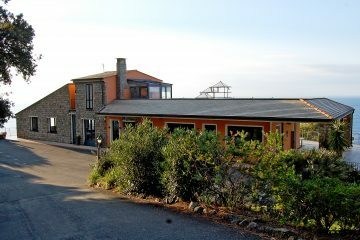 We then spent the next hour or so enjoying a bottle of local red wine, incredible traditional food and even better conversation. Sharing our food family-style, we enjoyed a starter of tortellini in a broth followed by tagliatelle al ragu and lasagne and each was just as amazing as the next. My favorite was the lasagne as it was traditionally made with spinach pasta and the combinations of flavors were just exceptional. Although the food was obviously a highlight, I really enjoyed the atmosphere of this restaurant. It was family-run by Tony’s son, whom we met, and it was full of locals chatting yet we felt really relaxed. 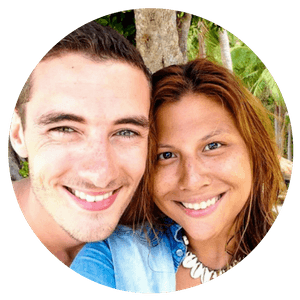 There was no feeling of rushing and we just spent the time talking about each other and getting to know more about Mattia’s tours, how he started and where he sees his business going in the future. With full bellies, we made our way through a beautiful part of the city towards our last stop: dessert at the Gelateria Mascarella. We were pretty full by this point but dessert is a different stomach and I can always make room for gelato! 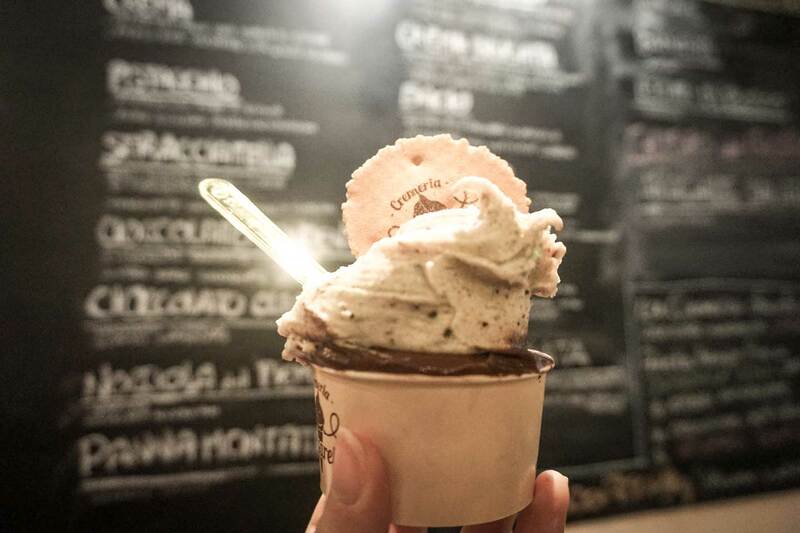 Browsing over the variety of interesting flavors, I chose a mix of chocolates and enjoyed the creamy artisanal Italian gelato as if it was the only thing happening in my life in that one moment. It was just a shame that after this heavenly dessert, it was time to say our goodbyes. It seemed like we had spent a whole day discovering the skill of Italian cooking and sampling homemade delicacies which were simply divine, but it was only half 2 by the time we finished. My first thought was how I loved days like this, days that were long and filled with food and unforgettable experiences, but then it quickly turned to sadness that it was over. After standing on a street corner and chatting with Mattia for a couple of minutes at the end, he said that he would be around and we finally said our goodbyes. 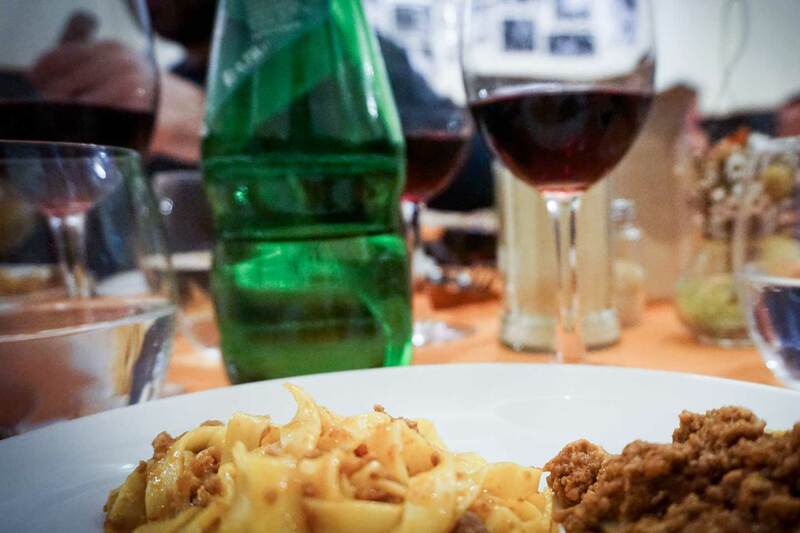 To say that we enjoyed this food tasting tour was a drastic understatement, it felt as though we were exploring the city with a friend and we finished the day learning so much about Bolognese cuisine and with a head full of places that we wanted to see and eat at next. After this tour, the rest of our week was spent exploring but we ended up returning to PizzArtist twice for lunch, we had a special meal at Trattoria Tony for Thanksgiving, and we even ended up buying balsamic vinegar, Parmigiano and cured meats for our family and ourselves which Franco kindly vacuum-packed for us. We did see Mattia again, who was so pleased that we had returned to the eateries loved by locals, and when we finally left Bologna after our week there, we thought of all the stories he told us and of all the traditional dishes that we shared together. 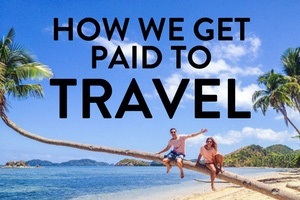 If you want to book this particular tour, click the button below to see details, read reviews, and more.